Glaucoma is a condition where the optic nerve becomes damaged. The optic nerve is the connection between the eye and the brain and is responsible for transmitting the image arriving at the retina back to the brain. Glaucoma is caused in 2/3 cases by an increase in pressure in the fluid that fills up the front chamber of the eye. It is important to have the eye pressure measured on a regular bases, at least every 2 years as damage can be easily prevented by early treatment. 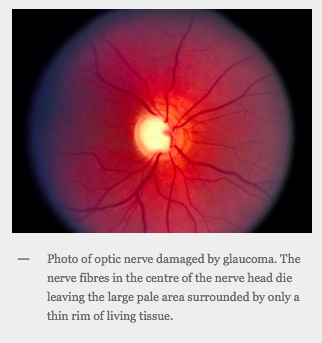 In 1/3 cases the pressure is normal but due to weakness within the optic nerve the nerve is still damaged. For this reason we recommend photographing the retina, which includes the optic nerve as a baseline for future comparison as it is subtle changes to the optic nerve that give us an early warning. In most cases of glaucoma there is a slow deterioration of peripheral vision which will usually go unnoticed by the patient until it becomes severe, producing “tunnel vision” and eventually total blindness. As early detection, well before you would notice any problem, is vital we recommend regular eye examinations at least every 2 years. If caught early enough treatment is usually simple and effective, requiring ongoing use of eye drops to lower the pressure within the eye. Other treatments may involve laser therapy to improve fluid drainage within the eye or very rarely surgery in intractable cases.